Don't let the click of an empty chamber result in mission failure while wearing the American Warrior Nylon Dual Magazine Holder from Stallion Leather. Featuring a ruggedized, 3/16-inch ballistic nylon construction, the holster has the weather-resistant durability needed to meet the demands of challenging tactical and combat applications. Each of the two individual pouches house double magazines and secure contents with full flap covers. Quick-release snaps ensure the covers stay fixed into place while still allowing quick mag access in emergency situations. American Warrior's versatile nylon weave and fabrication blends seamlessly with most other brands and manufacturers for maximum compatibility and a professional uniform appearance. 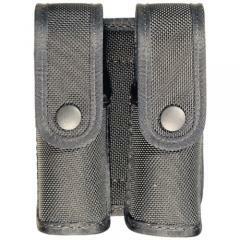 The holster fits duty belts up to 2.25-inches wide.